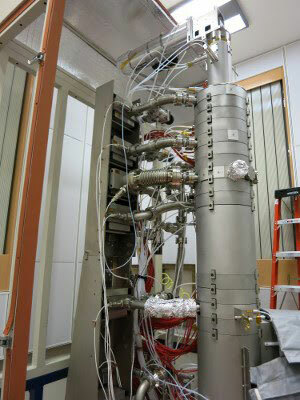 (Nanowerk News) A new super powerful electron microscope that can pinpoint the position of single atoms, and will help scientists push boundaries even further, in fields such as advanced materials, healthcare and power generation, has been unveiled yesterday, Thursday February 19th, by the Engineering and Physical Sciences Research Council (EPSRC). The £3.7 million Nion Hermes Scanning Transmission Electron Microscope, one of only three in the world, will be sited at the EPSRC SuperSTEM facility at the Daresbury laboratory complex near Warrington, which is part of the Science and Technology Facilities Council (STFC). SuperSTEM3, one of only three monochromated Nion electron microscopes in existence, boasts the world's highest energy resolution at a mere 10meV, along with the highest spatial resolution for a microscope operating in this energy range (0.1nm at 60kV, 0.8nm at 100kV). The microscope not only allows imaging of unprecedented resolution of objects a million times smaller than a human hair, but also analysis of materials. This means that researchers will not only be able to clearly identify the atoms, but observe the strength of the bonds between them. This will improve understanding of their electronic properties when in bulk and how they may perform when used. Minister for Universities, Science and Cities, Greg Clark, said: “The UK is a world leader in the development and application of STEM (Scanning Transmission Electron Microscope) techniques, and this new super-powerful microscope will ensure we remain world-class. SuperSTEM is supported by a network of collaborating Universities: Leeds, Glasgow, Liverpool, Manchester and Oxford and a Steering Committee. These provide extensive supporting expertise in the application of analytical electron microscopy to a broad variety of samples ranging from advanced materials to geological and even biological materials. The consortium also provides access to complementary electron microscopy and sample preparation techniques for the benefit of user project.